I love my Mom’s stuffed peppers and so does our entire family. It’s a super easy recipe which I really like 😉 This is one of those recipes that I do from memory and I sometimes make more and sometimes less. 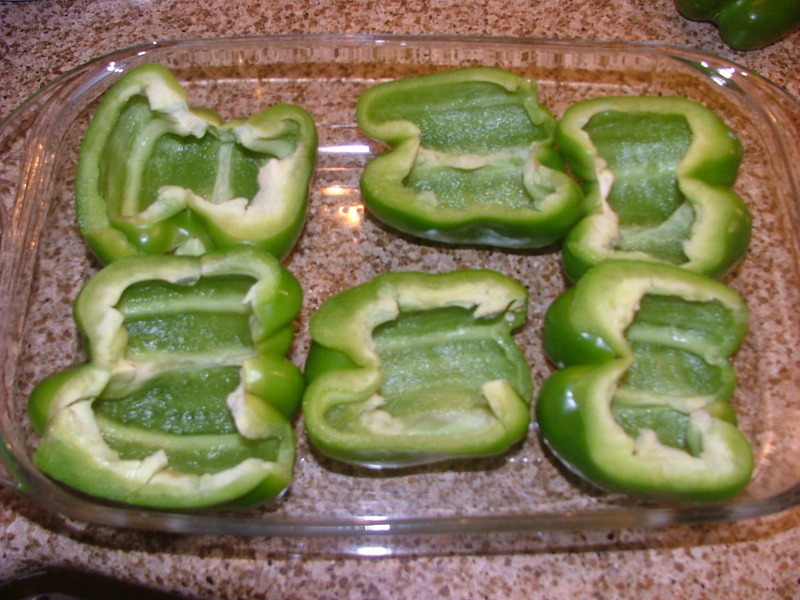 Place halved peppers in baking dish. Mix ground beef, tomato soup, rice, sugar, onions together in a large bowl. Stuff peppers evenly with this mixture. Pour tomato sauce over top of peppers. 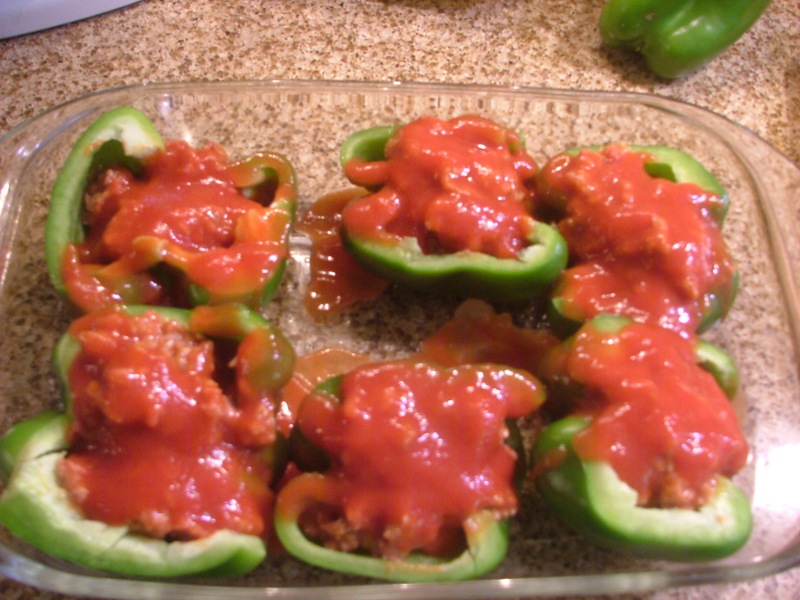 Cover and bake at 350º for 1 hour or until peppers are tender and meat is cooked through. Could you substitute minute rice for the raw rice? Sounds delicious! 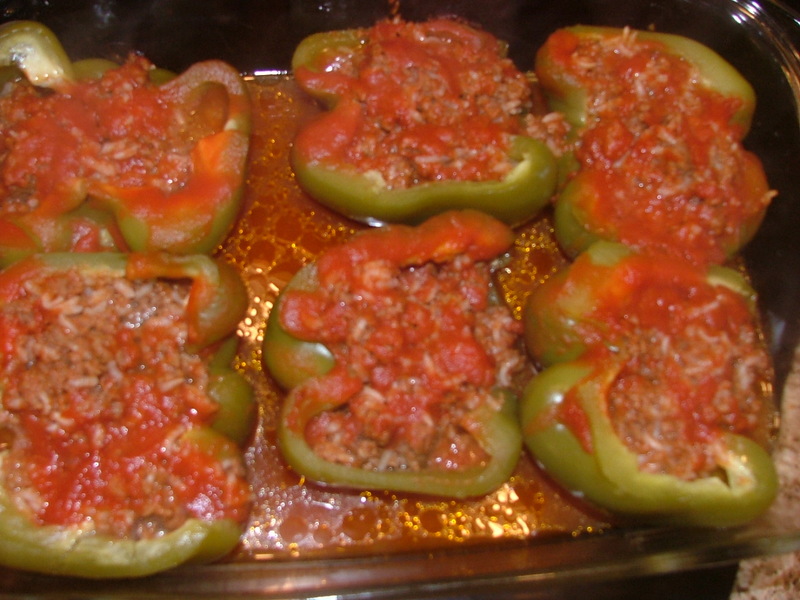 Very similar to my mom’s stuffed peppers, as well, but she cooked them in a large pot on the stove. She just hollowed them out, as one of the other bloggers mentioned. She simmered them for about 1-1/4 hours until they were cooked in the middle. One of the bloggers said she wasn’t sure if her kids would like it, but my mom always made some plain balls of the beef and rice mixture without a pepper, that she cooked in the sauce. I didn’t like the peppers when I was a kid, but now I do! are pretty close to this recipe → yeah, another one I never measured! Those changes sound delicious! Thank you for the reblog! Thanks so much for sharing your family recipe! I’m an American expat now living in Sweden and all of a sudden had a craving for stuffed peppers like my Mom & Grandma made back home in Pittsburgh. Yours is very similar to what I’m used to except that my Mom didn’t slice the peppers in half (she just hollowed them out). It’s an old fashioned recipe I think but we love it! Thanks for commenting! This recipe was perfect! It was exactly the one I remember as a child from my grandma’s house. The only modifications I made were to use ground turkey instead of beef and brown rice instead of white. Also, I mixed a squirt of ketchup into the tomato sauce before I poured it over the peppers. Thanks for posting this recipe! This was similar to my mom’s recipe too. We use ground turkey and brown rice too. We use a tablespoon of tomato soup on top of the peppers instead of tomato sauce.and we do not use any sugar since we’re trying to cut back. Made your recipe with some modification, Did not put sugar in,used medium yellow onion diced, and substituted salsa for tomato sauce. I wanted to try this recipe for supper tonight but not sure what to serve with it…any suggestions?? Love your recipes!! Keep them coming! I know this is going to sound weird because there is rice in the peppers but when I was growing up we had mashed potatoes with it and that’s what I still serve with them. And a green veggie even though the peppers are green. Sometimes I make carrots instead of a green veg but usually stick to the green. A salad and the peppers would be nice, too, instead of all the other. Thank you so much! I’ll let you know how they turn out (not sure if the kids will be crazy about them but I’ve been wanting to try this recipe for a while! Love this..bee trying to remember mom’s recipe with tomato soup, this is it! Thanks.. I love it when I find a recipe I have been looking for!!!! Thank you, Lynda, for the really nice comments 🙂 I LOVE your blog and am adding it to my list of links! I just found your site today through BlogCatalog & I love it ! I love cooking & eating the type of food you make and when I noticed that you are also an animal lover (all the animal rescue links etc in your sidebar !) I just had to spend some time here reading … I have added you as a favourite & will definitely come back regularly ! I also write a blog about my life here in Africa on a farm, all my animal rescue attempts (under my “Pets” section) and lots of simple, home cooked meals like yours. You have an amazing kitchen & recipe book collection – wow !